Children love to use their imaginations. From a very early age they enjoy putting on clothes and trying on shoes. In fact my 19 month old son has a shoe addiction. He tries on high heels, tennis shoes, sandals, you name it. As long as they aren't his shoes he wants to try them on for size. He struts his stuff around the house hamming it up and having a great time. My daughter (age 4) spends the majority of her time changing outfits. She goes from one extreme creation to the next creating and role playing as she goes. In our house the dog isn't even safe, I often see him walking by with a tutu on or a pair of wings and bows on his ears. While the boas, necklaces, big tacky dresses and leg warmers might seem like an odd combination to us they are an essential piece of child development and should be given as much praise and attention as academic accomplishments. Role playing is how your child deals with their emotions and it helps your child navigate situations or events your child doesn't quite understand. When ever we go away on a trip or stay at a hotel my little ones play "Hotel" for weeks after, dressing up, packing plastic Publix bags with all of their stuff, they pretend our closets are the elevators to their room, it is all very amusing to watch. While dressing up and playing pretend might seem like child's play this is a key component to growing up and helps lay an academic foundation for years to come. You would never think that playing dress up could help your child in math or writing but is does. Helping children learn to problem solve, think outside the box, find a resolution and use their imaginations are all key components to role play. Dress up centers use to be found in Kindergarten classrooms everywhere, now with such a strong push towards early academics our classrooms are quickly changing. So the next time your little ones want to dig through your closet or try on some of your old shoes encourage them to get creative, because learning to role play and use their imaginations today will help them to become more well rounded learners in the classroom tomorrow. 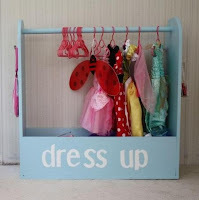 With Halloween right around the corner now would be a great time to set up a dress up station in your child's room. Remember dressing up is not just for the girls, there are several great costumes and household items out there for boys as well here are a few lists to help get you started! 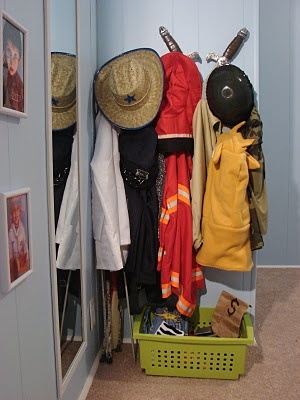 The key to a great dress up spot is organization! A tall mirror and a basket or trunk of creative accessories are a must. Check out a few of these ideas we found on pinterest! Mummy Monday get creative with lunch time!